SUMMARY: Recanalization of intracranial aneurysms following endovascular coiling remains a frustratingly common occurrence. An understanding of the molecular and histopathologic mechanisms of aneurysm healing following coil embolization is essential to improving aneurysm occlusion rates. Histopathologic studies in coiled human and experimental aneurysms suggest that during the first month postcoiling, thrombus formation and active inflammation occur within the aneurysm dome. Several months following embolization, the aneurysm is excluded from the parent vessel by formation of a neointimal layer, which is often thin and discontinuous, across the aneurysm neck. Numerous coil modifications and systemic therapies have been tested in animals and humans in an attempt to improve the aneurysm-healing process; these modifications have met with variable levels of success. In this review, we summarize the histopathologic and molecular biology of aneurysm healing and discuss how these findings have been applied in an attempt to improve angiographic outcomes in patients with intracranial aneurysms. Developing an understanding of biologic processes that are conducive to aneurysm healing following coil embolization is essential to improving patient outcomes. Endovascular coiling focuses on the structure and geometry of aneurysms rather than their biologic foundation. Greater understanding of biologic mechanisms of aneurysm healing allows investigators to develop new strategies or make modifications to current devices to accelerate healing and decrease recanalization rates. In this review article, we summarize the current state of the literature regarding the biology of aneurysm healing postcoiling and discuss future directions in aneurysm biology research. Aneurysms often recur early after treatment. Raymond and Darsaut9 reported that nearly 50% of subsequent recurrences were present by 6 months after coiling in humans. Various mechanisms underlying late aneurysm recanalization have been proposed, including the following: 1) growth of the aneurysm itself,10,11 2) poor thrombus organization as a result of the biologically inert platinum coil construction,12 3) instability of fresh, unorganized thrombus and degradation by fibrolysis, 4) continued transmission of blood pulsation affecting the association of the coil-thrombus complex,13 5) lack of neointima formation across the neck of aneurysm,14 and 6) formation of neovessels inside the aneurysms lumen, exposing the aneurysm cavity to blood flow. Histologic Findings of Human Cases. A, Zero-to-7 days: thin fibrin layer covers the coils (tan). Macrophage invasion is seen in the coil periphery (purple). Unorganized thrombus surrounds the coils (red). A thin-but-incomplete fibrin layer is seen at the aneurysm neck. B, One-to-2 weeks: increased fibrin coating of the coils (tan). Macrophages in the coil periphery (purple) and myofibroblast invasion (green) are seen. Note the thin fibrin layer at aneurysm neck. Endothelialization at the neck periphery and along the coil is seen. C, Two weeks to 1 month: increased myofibroblast invasion (green). Thrombus is more organized (red), and macrophages in the aneurysm periphery (purple) are seen. Note increased endothelialization of the aneurysm neck. D, One-to-3 months: decreased cellularity occurs within the aneurysm. Myofibroblasts (dark green) and macrophages (dark purple) die through apoptosis. Note increased endothelialization of the aneurysm neck. E, Three months plus: the aneurysm dome is acellular. Vascularized connective tissue is seen in the aneurysm dome (red fibers). Note increased fibrin coverage of coils (tan) and endothelialization of the aneurysm neck. There is a progressive increase in the amount of collagen within the aneurysm through 3 months. Thrombus Formation, Myofibroblast Invasion, and Extracellular Matrix Deposition. The formation of thrombus is essential to providing a provisional matrix to allow recruitment of cells involved in the aneurysm-healing process.4,27,28 Complete thrombus organization within the aneurysm cavity is associated with improved healing and neointima formation and is best appreciated in aneurysms with increased packing attenuation and small volumes.29 Within the first 2 weeks of coil embolization, stasis induced by the coils results in the formation of unorganized thrombus in the aneurysm dome (Fig 2A, -B).27,28 The core of the thrombus is typically acellular; however, myofibroblasts can be seen in the periphery of the thrombus. The origin of these myofibroblasts remains unclear because some suggest that myofibroblasts arise from differentiation of macrophages present within the thrombus, while others suggest that they arise from the aneurysm wall.27,28 During 4 weeks, there is progressive infiltration of the aneurysm dome by myofibroblasts. Myofibroblast infiltration of the aneurysm dome is important because these cells promote collagen synthesis and deposition and express contractile protein processes essential to most wound healing. However, in the case of the rabbit model of intracranial aneurysms, sparse collagen deposition is seen in the aneurysm dome following myofibroblast infiltration and contraction of the aneurysm sac has yet to be appreciated in experimental models.27 At approximately 4 weeks following coil embolization, these myofibroblasts undergo apoptosis and are no longer present in the aneurysm dome.27 After 10 weeks, the aneurysm dome is primarily composed of vascularized, loose hypocellular tissue (Fig 2G, -H). A and B, Histopathologic hematoxylin-eosin stains (original magnification ×15 and ×60, respectively) of a rabbit aneurysm dome 1 week postcoiling demonstrate unorganized thrombus filling the aneurysm dome around the coil loops. No endothelialization has occurred at the aneurysm neck. Histopathologic hematoxylin-eosin stains (original magnification ×10 and ×150, respectively) for a rabbit aneurysm dome 6 weeks postcoiling demonstrate loose connective tissue in the aneurysm dome surrounding the coil loops (C) and an incomplete layer of endothelium-lined neointima over the aneurysm neck (D). The neointima and endothelial cells at the neck interface are both continuous with that of the parent artery. E and F, Histopathologic hematoxylin-eosin stains (original magnification ×10 and ×15, respectively) 12 months postcoiling demonstrate loose connective tissue in the aneurysm dome surrounding coil loops (E) and a layer of neointima of variable thickness covering the aneurysm neck (F). The neointima and endothelial cells at the neck interface are both continuous with those of the parent artery. G and H, Histopathologic hematoxylin-eosin stains (original magnification, ×20 and ×125, respectively) of the aneurysm dome 12 months postcoiling demonstrate loose connective tissue in the aneurysm dome. In a study of 20 rabbit aneurysms undergoing coil embolization, Kadirvel et al31 found that the apoptotic cells in the aneurysm sac were predominantly myofibroblasts. Apoptosis of cells in the aneurysm dome is thought to occur due to lack of physiologic stimulation from pulsatile flow secondary to the stasis induced by the aneurysm coils. This explanation is further supported by the fact that markers of apoptosis are strongly expressed in the aneurysm dome, but not at the aneurysm neck. Furthermore, studies suggest that low wall shear stress diminishes the ability of the aneurysm wall to function and maintain a healthy endothelium and upregulates expression of matrix metalloproteinases, molecules thought to play a role in aneurysm formation and recanalization.32 A study performed by Qi et al32 found that low shear stress promotes both vascular smooth muscle cell migration and apoptosis in the rat aorta. The biology of the aneurysm neck differs from that of the aneurysm dome. Recruitment of endothelial cells to the site of the aneurysm neck is thought to be essential to ensuring adequate healing of the treated aneurysm. Rabbit models generally demonstrate only a single, partial layer of endothelial cells at the aneurysm neck (Fig 2C–F).4,15,17,19,21,23,24 Swine models of aneurysm healing demonstrate robust neointima formation with a thick layer of vascular smooth muscle cells and robust deposition of endothelial cells.4,33 Endothelial cells are primarily seen growing along the coils at the aneurysm neck; this feature has led some investigators to believe that the endothelial cells arise from the adjacent vessel wall.18,25 However, recent studies suggest that endothelial cells found at the aneurysm neck may originate from bone marrow–derived endothelial progenitor cells rather than migration of adjacent endothelial cells.34,35 Studies in humans suggest that circulating endothelial progenitor cells are mobilized after endovascular therapy; these findings suggest that vessel injury promotes mobilization of the endothelial progenitor cells to the aneurysm neck.36 Promotion of endothelial growth along the aneurysm neck is a potential therapeutic target to improve aneurysm healing. Similarity and Differences in the Wound-Healing Process. The process of wound healing differs from that of aneurysm healing following coil embolization. Perhaps the most important difference is that the extensive collagen matrix seen following healing of a wound is not seen following coil embolization. Histologic and gene-expression studies have demonstrated that collagen is not highly expressed in treated aneurysms, both well-healed and poorly healed. The role of myofibroblasts, however, is likely similar in both healing wounds and coiled aneurysms. Myofibroblasts are thought to promote retraction of the aneurysm wall just as they promote wound retraction. Thus, early apoptosis of myofibroblasts, when the aneurysm is still not fully healed, is of so much interest. Prevention of myofibroblastic apoptosis early in the aneurysm-healing process could allow the aneurysm-healing process to more closely emulate the wound-healing process, resulting in improved occlusion rates. Molecular Biology of Aneurysm Healing and Recanalization. Osteopontin, a cell-adhesion molecule, has markedly increased expression in densely packed and well-healed aneurysms.44,45 This is important because osteopontin plays a key role in chemotaxis and wound healing and helps promote cell adhesion to the extracellular matrix and cell migration.46 Furthermore, this molecule inhibits apoptosis and enhances cell proliferations. Case reports that have demonstrated the presence of bony metaplasia in the postcoiling aneurysm sac further highlight the potential role that osteopontin may play in aneurysm healing. Dai et al47 reported 2 cases of bone formation, 1 in the aneurysmal sac and 1 in the aneurysm neck. Plenk et al48 found cartilage neoformation in 6 of 144 experimental aneurysms (4.2%) and bone formation in 9 of 144 experimental aneurysms (6.3%). The source of bone formation is still unknown. Potential sources include mesenchymal stem cells arising from the arterial wall, metaplasia of arterial wall smooth muscle cells into chondrocytes, and osteoblasts. These hypotheses are supported by the fact that osteopontin has been shown to promote differentiation of vascular smooth muscle and mesenchymal stem cells to an osteogenic phenotype.49,50 Given the potential role of osteopontin in aneurysmal healing, osteopontin has emerged as a potential therapeutic target. The role of matrix metalloproteinases in aneurysm healing is currently controversial. Bouzaghrane et al51 found that matrix metalloproteinase-9 (MMP-9) may play a key role in aneurysm recanalization in both murine and canine models. MMP-9 messenger RNA and protein were seen in higher concentrations in recanalized aneurysms compared with well-healed aneurysms. However, in a rabbit model, Kadirvel et al44 found that MMP-9 was more highly expressed in well-healed aneurysms than in poorly healed ones. It is likely that MMP-9 expression has properties that are both conducive and inhibitory to aneurysm healing. On the one hand, MMP-9 may cause recanalization by promoting artery injury and aneurysm growth. However, on the other hand, MMP-9 is essential to many important facets of aneurysm healing. MMP-9 regulates migration of smooth muscle cells from the tunica media to the intima; this regulation helps promote neointima formation along the aneurysm neck, an essential component in aneurysm healing.44,52 Many studies by using rabbit, canine, and swine models have found that well-healed aneurysms demonstrate endothelial cell proliferation along the aneurysm neck, and MMP-9 may be essential to this process. Many investigators have applied the findings from biologic studies to devising means of enhancing the aneurysm-healing process. A summary of the histopathologic and molecular biologic characteristics of well-healed and poorly healed aneurysms is found in the Table. These findings provide the framework for the device modifications and systemic therapies described below. Studies highlighting the importance of early thrombus formation in the aneurysm sac led to the development and testing of thrombogenic-/antithrombolytic-coated coils in the experimental rabbit model. However, early studies revealed that both conventional coils and antithrombolytic coils had similar histopathologic and angiographic findings, including a thin membrane of neotintima covering the aneurysm neck and intra-aneurysmal scar formation.53 Studies highlighting the importance of myofibroblasts in aneurysm healing led to the development of fibroblast-coated coils. 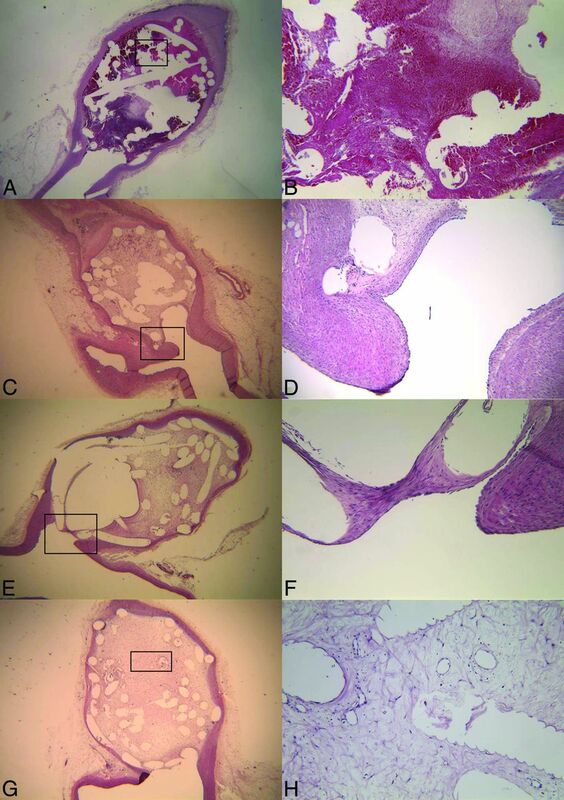 Early studies in rabbits found that fibroblast allografts were viable and proliferated in the vascular space in rabbits and remained within the aneurysmal sac.54 In a study of rabbits treated with fibroblast-coated coils, Dai et al55,56 found that fibroblast-coated coils accelerated early histologic healing and even promoted endothelialization of the aneurysm neck. However, these coils have yet to be tested in humans. A number of systemic therapies have been tested to improve aneurysm healing. Because vitamin C is known to stimulate collagen synthesis and cross-linking, it was identified as a potential therapeutic agent for patients with coiling. However, a recent study by using the rabbit aneurysm model found that vitamin C did not result in improvement of aneurysm occlusion.62 Zhang et al63 studied the therapeutic benefit of bone marrow–derived endothelial progenitor cell transfusion following aneurysm embolization in a rat model. In this study, bone marrow–derived endothelial progenitor cells were labeled and transfused following aneurysm embolization. Zhang et al demonstrated that the labeled cells accumulated at the aneurysm neck, accelerating repair and remodeling of the neck. As mentioned previously, our understanding of the mechanisms of healing of coiled intracranial aneurysms has led to some practical improvements in coil technology aimed at decreasing the rates of aneurysm recurrence. Our review of the literature suggests that most of the healing process following coiling occurs within the first month postembolization. Future investigations should focus on means to induce and accelerate a healing response similar to that of wound healing with collagen deposition, resulting in increased occlusion of the aneurysm dome. Coil-modification technologies and systemic administration of medications known to accelerate wound healing are potential means of accomplishing this aim. In addition, therapies and coil modifications aimed at increasing endothelialization of the aneurysm neck to completely exclude the aneurysm from the parent vessel are essential because both rabbit and human models demonstrate that endothelialization along the aneurysm neck is limited. Further research is also needed in improving animal models for embolization of intracranial aneurysms. There is currently no model of aneurysm rupture, growth, or mass effect that would be amenable to coil embolization. There are limited human postmortem examination specimens of postcoiled ruptured intracranial aneurysms. The healing of the postcoiled intracranial aneurysm is a dynamic process. Much of the active healing process occurs within the first 4 weeks of coil embolization. Histopathologic studies have demonstrated that myofibroblasts play an important role in healing of the aneurysm dome, while endothelialization with endothelial progenitor cells is essential for healing the aneurysm neck. Gene and protein studies have demonstrated that factors such as MMPs and osteopontin may play an integral role in the aneurysm-healing process. Findings from histopathologic and molecular studies have been applied to develop treatment methods aimed at improving the aneurysm-healing process. Disclosures: Waleed Brinjikji—UNRELATED: Grants/Grants Pending: Brain Aneurysm Foundation. * David F. Kallmes—RELATED: Grant: ev3*; UNRELATED: Board Membership: GE Healthcare (Cost Effectiveness Board); Consultancy: ev3,* Comments: preclinical and clinical research; Grants/Grants Pending: ev3,* MicroVention,* Sequent Medical,* Surmodics,* Codman*; Royalties: University of Virginia Patent Foundation (Spine Fusion). Ram Kadirvel—RELATED: Grant: National Institutes of Health (NS076491). * *Money paid to the institution. Could Statin Use Be Associated with Reduced Recurrence Rates following Coiling in Ruptured Intracranial Aneurysms?